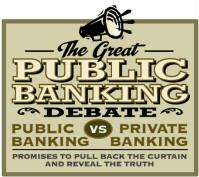 2014 is the year that the Public Banking Institute brings public banking into the public discussion. What better way to do it than to have a public debate - old style? Does your county need a public bank? Should your state start its own bank? Debate it -- in the open, with your friends and colleagues. It's past time to get this question out in the open. We could very well be on the brink of another credit crisis, brought to us by Wall Street and the Federal Government. Debating this topic will give us an idea of what sort of alternative we could construct for ourselves. Move Your Money and the Public Banking Institute envision communities across America enjoying lasting prosperity with full employment in a robust economy. Public banking will help enable this vision by providing communities with the sustainable supply of affordable credit that the private interests of Wall Street banks have failed to deliver. These banks are constricting the flow of credit while making huge profits on other business pursuits. To top it off, interest is a hidden cost built into the cost structure of every product or service -- on average over 40% of the cost goes to interest! More info from Margrit Kennedy, here. Despite this imbalance, tax jurisdictions such as states and municipal governments keep many billions of dollars of public funds on deposit in Wall Street banks. These deposits could instead serve the public interest, generating affordable credit in local communities to help businesses create jobs and families regain financial stability. These deposits could instead serve the public interest, enabling affordable credit in local communities to help businesses create jobs and families regain financial stability. States and cities can produce these benefits by forming their own banks to regain full control of their massive tax-revenue deposits. Resulting credit resources help ensure stable supplies of local credit. In the process, public banks generate significant profits, just as the state-owned Bank of North Dakota does. Profits from public banks are reinvested in communities to increase the tax base and/or returned to the public treasury, to reduce tax burdens. The time for public institutions to place public money into private banks, which then use the public money for their own private gain, is over. Private banks have squandered the public trust. 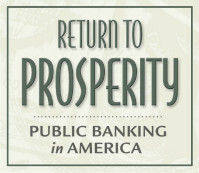 Public money should be placed in public institutions -- public banks -- for the benefit of the public. Assuming safety, liquidity and return can be adequately addressed, there is no reason for governments NOT to put the public's money into public banks. After all, public banks ensure that the money is used for the benefit of the very same people who generated that money in the first place! MoveOurMoney.net is a coalition of organizations which advocate school districts, local, and state governments to move OUR money from the private banks to public banks. Members of this coalition believe in a democratic economy – with a monetary system that is democratically managed by public institutions. We believe that the best way to end the hegemony and fraud so evident in the existing private monetary system is to simply not participate in it. We are creating a separate credit generating system through public banks that will better serve the people. We are creating a new world - join us! It's only just begun. Now you can support any of these programs by becoming a Founders' Circle Member, a Sponsor, or a Member. Click here to find out more. Tired of having Wall Street -- and Washington D.C. -- control both the money supply and the rules under which it operates? Vermonters are, too. No fewer than THREE bills have been introduced into their state legislature -- one for a state bank study, one for a state currency, and one for a state voucher/warrant system. It's time that states, counties and cities controlled their own destiny with a democratic approach to money. Let's face it -- most Americans are banking illiterate. We've decided to do something about it. The Student Banking Project is an easy way for students in participating schools to be issued gift currency to be used in a gift economy. Money issued as debt is possible in this game, but students may choose this with eyes wide open. The only rule at the outset of each year is ...no interest allowed! Other rules, such as how the currency is issued, how it is redeemed, etc. are determined by the students. More info here. Timeline history of banking here. Get involved -- Make a Difference!